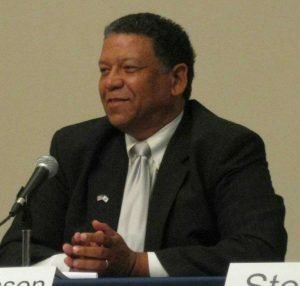 Vernon Robinson will address Haywood Republican Alliance on June 27th at 6:00 pm, preceded by a potluck supper at 5:30PM. His topic will be his experience over the last 30 years with grassroots activism. This will be a must see for all true conservatives who wish to promote conservative ideas and foster strong conservative relationships. This event will take place at the Haywood Republican Alliance Headquarters at 377 Walnut Street Waynesville NC 28786. A pot luck dinner will be served. All interested parties are welcome to attend and admission is free. Vernon Robinson is President of Robinson Stratavision Counseling. He is the latest in line of a family of veterans that goes back to his five great grandfather at the Battle of New Orleans. 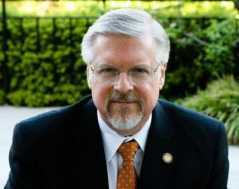 A 1977 Air Force Academy grad, Robinson now concerns himself with defending the Constitution from domestic enemies, Marxists who now control the opposition party, and useful idiots in the GOP who compromise the Constitution. After the election, the duty of the citizen is to guide their elected officials to preserve or restore a limited constitutional government built on the idea that citizens are sovereign with unalienable rights that come from God. The biggest impediment to performing that duty is access to timely information on what is happening in the Congress. 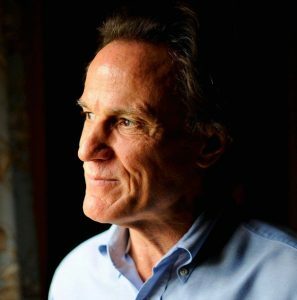 He will discuss his experience with the grassroots organizing over the last 30 years and resources that help citizens do their duty to hold elected officials accountable. 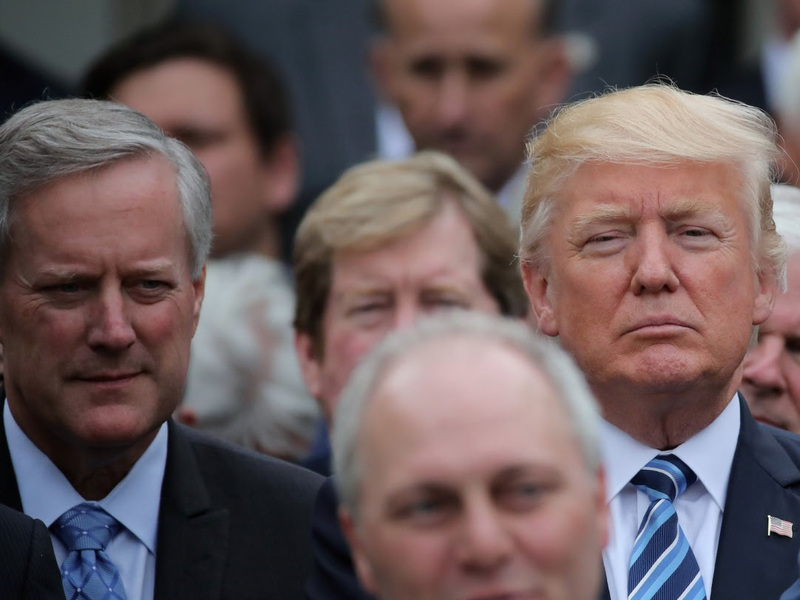 I’ll admit it – Donald Trump was not the guy I wanted to see win the Republican nomination for President. But he did, he won election, and he is now my President. His commencement speech at Liberty University yesterday impressed me. One reason is the fact that he spoke deeply, broadly, and powerfully about faith in a way I don’t recall ever seeing a President speak before. Thank you very much. everybody. And congratulations to the class of 2017. That’s some achievement. But here we are celebrating together on this very joyous occasion, and there is no place in the world I’d rather be to give my first commencement address as President than here with my wonderful friends at Liberty University. And I accepted this invitation a long time ago. I said to Jerry that I’d be there, and when I say something I mean it. Most importantly to our new graduates: Each of you should take immense pride in what you have achieved. There’s another group of amazing people we want to celebrate today and they are the ones who have made this journey possible for you, and you know who that is? Nobody, you forgot already. You’re going to go out, you’re going to do whatever you’re going to do, some are going to make a lot of money, some are going to be even happier doing other things — they’re your parents and your grandparents, don’t forget them. You haven’t forgotten yet, have you? Never, ever forget them, they’re great. And especially this weekend, let’s make sure we give a really extra special thanks to the moms. Don’t forget our moms, because graduates, today is your day. Today is your day. But in all of this excitement don’t forget that tomorrow is Mother’s Day, right? I had a great mother, she’s looking down, now but I had a great mother. I always loved Mother’s Day. We’re also deeply honored to be joined by some of the nearly 6000 service members, military veterans and military spouses who are receiving their diplomas today. Will you please stand. Please stand. Wow. That’s great. Thank you very much, great job. We’re profoundly grateful to every single one of you who sacrificed to keep us safe and protect God’s precious gift of freedom. It is truly a testament to this university and to the values that you embrace that your graduating class includes so many patriots who have served our country in uniform. Thank you very much. To the class of 2017: Today you end one chapter but you are about to begin the greatest adventure of your life. Just think for a moment of how blessed you are to be here today at this great, great university, living in this amazing country, surrounded by people who you love and care about so much. Then ask yourself, with all of those blessings, and all of the blessings that you’ve been given, what will you give back to this country and, indeed, to the world? What imprint will you leave in the sands of history? What will future Americans say we did in our brief time right here on Earth? Did we take risks? Did we dare to defy expectations? Did we challenge accepted wisdom and take on established systems? I think I did, but we all did and we’re all doing it. Or did we just go along with convention, swim downstream, so easily with the current and just give in because it was the easy way, it was the traditional way or it was the accepted way? Remember this, nothing worth doing ever, ever, ever came easy. Following your convictions means you must be willing to face criticism from those who lack the same courage to do what is right — and they know what is right, but they don’t have the courage or the guts or the stamina to take it and to do it. It’s called the road less traveled. I know that each of you will be a warrior for the truth, will be a warrior for our country, and for your family. I know that each of you will do what is right, not what is the easy way, and that you will be true to yourself, and your country, and your beliefs. In my short time in Washington I’ve seen firsthand how the system is broken. A small group of failed voices who think they know everything and understand everyone want to tell everybody else how to live and what to do and how to think. But you aren’t going to let other people tell you what you believe, especially when you know that you’re right. And those of you graduating here today, who have given half a million hours of charity last year alone, unbelievable amount of work and charity and few universities or colleges can claim anything even close, we don’t need a lecture from Washington on how to lead our lives. I’m standing here looking at the next generation of American leaders. There may very well be a president or two in our midst. Anybody think they’re going to be president, raise your hand. In your hearts are inscribed the values of service, sacrifice and devotion. Now you must go forth into the world and turn your hopes and dreams into action. America has always been the land of dreams because America is a nation of true believers. When the pilgrims landed at Plymouth they prayed. When the founders wrote the Declaration of Independence, they invoked our creator four times, because in America we don’t worship government we worship God. That is why our elected officials put their hands on the Bible and say, ‘So help me God,’ as they take the oath of office. It is why our currency proudly declares, ‘In God we trust,’ and it’s why we proudly proclaim that we are one nation under God every time we say the pledge of allegiance. In just two days we will mark the 10th anniversary of Reverend Falwell’s passing, and I used to love watching him on television, hearing him preach, he was a very special man. He would be so proud not just at what you’ve achieved but of the young men and women of character that you’ve all become. And Jerry, I know your dad is looking down on you right now and he is proud, he is very proud, so congratulations on a great job Jerry. Reverend Falwell’s life is a testament to the power of faith to change the world. The inspiring legacy that we see all around us in this great stadium — this is a beautiful stadium and it is packed. I’m so happy about that. I said, ‘How are you going to fill up a place like that?’ It is packed, Jerry. In this beautiful campus and in your smiling faces but it all began with a vision. That vision was of a world class university for evangelical Christians. And I want to thank you, because boy did you come out and vote, those of you that are old enough, in other words your parents. Boy oh boy, you voted, you voted. No doubt many people told him his vision was impossible, and I am sure they continued to say that so long after he started, at the beginning with just 154 students, but the fact is no one has ever achieved anything significant without a chorus of critics standing on the sidelines explaining why it can’t be done. Nothing is easier or more pathetic than being a critic, because they’re people that can’t get the job done. But the future belongs to the dreamers, not to the critics. the future belongs to the people who follow their heart no matter what the critics say because they truly believe in their vision. At Liberty your leaders knew from the very beginning that a strong athletic program would help this campus grow so that this school might transform more lives. That is why a crucial part of Reverend Falwell’s vision for making Liberty a world-class institution was having a world-class football team much like the great teams of Notre Dame, great school, great place, in fact, Vice President Mike Pence is there today doing a fabulous job as he always does. Thanks to hard work, great faith, and incredible devotion those dreams have come true. As of February of this year, the Liberty Flames are playing in the FBS, the highest level of competition in NCAA football. Don’t, don’t clap, that could be tough. Don’t clap. That could be tough. I’m a little worried. I don’t want to look at some of those scores here. Jerry, you sure you know what you’re doing here? Those other players are big and fast and strong but I have a feeling you’re going to do very well, right? From the most humble roots you’ve become a powerhouse in both education and sports. And just wait until the world hears the football teams you’ll be playing on your schedule starting next season. President Falwell gave me a list of some of those schools, the ones you’re going to be playing 2018. Would you like me to read the names? Just came out, would you like to hear them? I’m a little bit concerned. UMass, Virginia, Auburn — Jerry, are you sure you know what you’re doing? Jerry, Auburn? I don’t know about that James. This could be trouble, Jerry. Rutgers, Old Dominion, Brigham Young, Army — I might be at that game, who am I supposed to root for? Tell me. I don’t know. That’s a tough one, Jerry. I don’t know, Jerry, I’m going to have to think about that one, Jerry. Buffalo, Troy, Virginia Tech, oh no, Jerry, Ole Miss and wake forest, those are really top schools. maybe in four or five years I’ll come to a game, right, you’ll build it up. Well good luck. The success of your athletic program arriving on the big stage should be a reminder to every new graduate of just what you can achieve when you start small, pursue a big vision and never, ever quit. You never quit. If I give you one message to hold in your hearts today, it’s this. Never, ever give up. There will be times in your life you’ll want to quit, you’ll want to go home, you’ll want to go home perhaps to that wonderful mother that’s sitting back there watching you and say, ‘Mom, I can’t do it. I can’t do it.’ Just never quit. Go back home and tell mom, dad, I can do it, I can do it. I will do it, you’re going to be successful. I’ve seen so many brilliant people, they gave up in life, they were totally brilliant, they were top of their class, they were the best students, they were the best of everything, they gave up. I’ve seen others who really didn’t have that talent or that ability and they’re among the most successful people today in the world because they never quit and they never gave up. So just remember that. Never stop fighting for what you believe in and for the people who care about you. Carry yourself with dignity and pride. Demand the best from yourself and be totally unafraid to challenge entrenched interests and failed power structures. Does that sound familiar by the way? The more people tell you it’s not possible, that it can’t be done, the more you should be absolutely determined to prove them wrong. Treat the word ‘impossible’ as nothing more than motivation. Relish the opportunity to be an outsider. Embrace that label — being an outsider is fine, embrace the label — because it’s the outsiders who change the world and who make a real and lasting difference. The more that a broken system tells you that you’re wrong, the more certain you should be that you must keep pushing ahead, you must keep pushing forward. And always have the courage to be yourself. Most importantly, you have to do what you love. You have to do what you love. I’ve seen so many people, they’re forced through lost of reasons, sometimes including family, to go down a path that they don’t want to go down, to go down a path that leads them to something that they don’t love, that they don’t enjoy. You have to do what you love, or you most likely won’t be very successful at it. So do what you love. I want to recognize a friend who is here with us today, who can serve as an inspiration to us all. Someone who doesn’t know the meaning of the word ‘quit’. Real champion. A true, true champion. Both on the field, off the field, he’s a Hall of Fame quarterback for the Buffalo Bills, really a good friend of mine, an amazing guy, Jim Kelly, where is Jim, he’s here some place. Where is Jim, stand up, Jim. What a great man. Jim Kelly, he was tough. Jim do you have any idea how much money you’d be making today? They’d hit Jim, it was like tackling a linebacker. They’d hit Jim, four guy, five guys that weighed 320, and he’d just keep going down the field. He was much more than a quarterback. He had tremendous heart and he knew how to win. Jim is tough, and his toughest fight of all was that he beat cancer not once but twice. And I saw him and his incredible wife as they were in a very low moment, Jill, very, very low moment, and it was amazing the way they fought. It didn’t look good, I would have said, maybe, maybe it’s not going to happen. But there was always that hope because of Jim and Jim’s heart. But I want to just say it’s great to have you here today Jim and these people are big, big fans and if you can get a young version of Jim Kelly, you’ll be beating a lot of teams, Jerry. So, interestingly, though, I said ‘I wonder what Jim’s doing here,’ his daughter Erin crosses the goal line to you and today with you so, Erin, stand up. Where are you, Erin? Where is Erin? Congratulations, Erin. Congratulations. Graduating from Liberty. Great choice, thank you. Liberty University is a place where they really have true champions and you have a simple creed that you live by: To be, really, champions for Christ. Whether you’re called to be a missionary overseas, to shepherd a church or to be a leader in your community, you are living witness of the gospel message of faith, hope and love. And I must tell you I am so proud as your president to have helped you along over the past short period of time. I said I was going to do it, and Jerry, I did it. And a lot of people are very happy with what’s taken place, especially last week, we did some very important signings, right James? Very important signings. We will always stand up for the right of all Americans to pray to God and to follow his teachings. America is beginning a new chapter. Today each of you begins a new chapter as well. When your story goes from here, it will be defined by your vision, your perseverance and your grit. That’s a word Jim Kelly knows very well, your grit. In this, I’m reminded of another man you know very well and who has joined us here today. His name is George Rogers, Liberty University CFO and vice president for a quarter of a century. During World War II, George spent three-and-a-half years as a prisoner of war. He saw many of his fellow soldiers die during the Bataan death march. He was the victim of starvation and torture as a prisoner of war. When he was finally set free he weighed just 85 pounds and was told he would not live past the age of 40. Today George is 98 years old. Great. That’s so great, George. If anyone ever had reason to quit, to give in to the bitterness and anger that we all face at some point, to lose hope in God’s vision for his life, it was indeed George Rogers. But that’s not what he did. He stood up for his country, he stood up for his community. 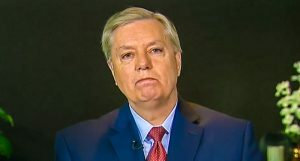 He stood up for his family and he defended civilization against a tide of barbarity, the kind of barbarity we’re seeing today and we’ve been witnessing over the last number of years and I just want to tell you as your president, we are doing very, very well in countering it, so you just hang in there. Things are going along very, very well. You’ll be hearing a lot about it next week from our generals Things are going along very, very well. Through it all, he kept his faith in God, even in the darkest depths of despair. Like so many others of his generation, George came home to a nation full of optimism and pride and began to live out the American dream. He started a family, he discovered God’s plan for him and pursued that vision with all his might, pouring his passion into a tiny college in a place called Lynchburg, Virginia. Did you ever hear of that? Lynchburg? We love, we love it. Do you like it? We like it, right? I flew over it a little while ago. It’s amazing, actually. What started as a dream with a few good friends he helped shepherd into the largest Christian university in the world. Just look at this amazing, soaring, growing campus and I’ve been watching it grow because I’ve been a friend of Liberty for a long time, now, Jerry. It’s been a long time. Thanks in great part George’s financial stewardship hundreds of thousands of young hearts and souls have been enriched at Liberty and inspired by the spirit of God. George, we thank you, and we salute you, and you just stay healthy for a long time, George, thank you. Now it falls on the shoulders of each of you here today to protect the freedom that patriots like George earned with their incredible sacrifice. Fortunately you have been equipped with the tools from your time right here on this campus to make the right decisions and to serve God, family and country. As you build good lives, you will also be rebuilding our nation. You’ll be leaders in your communities, stewards of great institutions and defenders of liberty and you will be great mothers and fathers and grandmothers and grandfathers, loving friends and loving family members. You will build a future where we have the courage to chase our dreams no matter what the cynics and the doubters have to say. You will have the confidence to speak the hopes in your hearts and to express the love that stirs your souls. And you will have the faith to replace a broken establishment with a government that serves and protects the people. And as long as America remains true to its values, loyal to its citizens, and devoted to its creator, then our best days are yet to come, I can promise you that. This has been an exceptional morning. It’s been a great honor for me and I want to thank you, the students. I also want to thank you, the family, for getting them there ,and I want to thank and congratulate Liberty. May God bless the class of 2017. May god bless the United States of America. May God bless all of you here today. Thank you very much, thank you. Thank you. As you probably know, last week the House passed a newly revised version of the American Healthcare Act (AHCA). 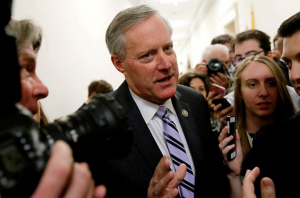 The new version of the bill was supported by myself and my colleagues in the House Freedom Caucus. 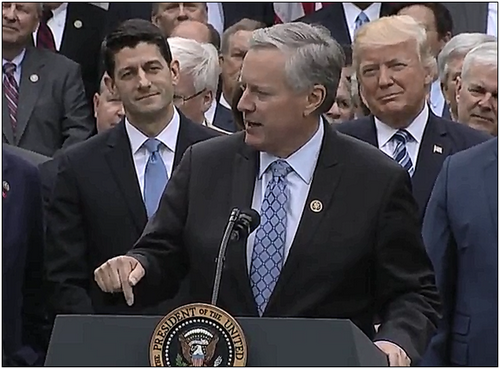 From the very beginning of this process, I’ve stated that my goals were to 1) bring down premiums for Americans, and 2) protect those with pre-existing conditions. When the original version of this bill was released, I did not feel that either goal would be accomplished, and thus, I made it clear that I would not support the bill without substantial changes. After weeks of negotiations, meetings, countless hours of discussion, and substantive changes to the bill, I’m thrilled to say that significant improvements were made. I believe we reached the point where both of these criteria will be met – premiums will go down, and people with pre-existing conditions will have a real, reliable safety net. While there are a lot of individuals who deserve credit for this, I particularly want to recognize my friend, Congressman Tom MacArthur and Rep. Fred Upton, for his work in negotiating the closing details of the bill. He was a critical player in getting this done. I also want to thank President Trump – I cannot tell you all how much I’ve seen this President work behind the scenes to bring this deal home. You have a President that is incredibly focused on keeping his campaign promises to you. This bill is a major step in that agenda and a major step toward repealing and replacing Obamacare. This has been a long process, and there is still work to be done with my Senate colleagues on improving the bill – but last week’s vote is a vital step in bringing relief to so many Americans that are being crushed by the broken system of Obamacare. Today we are one step closer. Help is on the way. To read my full statement, click here. As we move forward in the healthcare policy debate, keep in mind that the AHCA is still going through an extensive legislative process in the Senate. When the Senate makes changes, the bill will come back to the House where the two bodies will reach an agreement on a proposal. Right now I am actively working with my Senate colleagues on negotiations to ensure that we get the best outcome possible for the American people. You can read about those conversations here. I will keep working with them until we reach a solution that finishes the job. As you’ve probably heard me say many times by now, protecting people with pre-existing conditions was one of my chief concerns throughout the entire healthcare debate. In fact, the issue of pre-existing conditions was among the reasons I opposed the original version of the AHCAdespite pressure from even those in my own party. While the bill is not perfect, I believe that after weeks of negotiations and substantive changes from the original version, the AHCA now strikes a positive balance between eliminating burdensome regulations, giving States options, and not leaving people with pre-existing conditions vulnerable. It would go a long way in accomplishing our goals of bringing premiums down and providing a better, more reliable safety net of protection for those at risk. Specifically, protections such as “guaranteed issue” and “continuous coverage” remain on the books. What this means is that a state waiver will not apply to anyone who has insurance right now or maintains their already existing plan. In other words, if you are someone with a pre-existing condition who has signed up for coverage already on an Obamacare plan (or another insurance plan), your protections will still apply even if your state applies for a waiver from the Health and Human Services Department. Furthermore, even if you do not maintain insurance coverage and your state successfully applies for a waiver, your state would still be required to establish a high-risk pool to help offset some of the costs associated with additional fees. To read more about exactly what the bill does with pre-existing conditions, I encourage you to read this National Review article here. Below are some bullet points quoted from the article to give you an idea of what the bill accomplishes. Under the new bill, States would be able to waive Obamacare rules on preexisting conditions only for people who do not maintain insurance coverage. If you are someone with one of those conditions who has gotten coverage through Obamacare (or otherwise gotten coverage), the Obamacare regulations will still apply: In no state will it be possible for an insurance company to charge you more than a person without such a condition. If you are someone who has insurance and develops one of these conditions, you too will be covered by the Obamacare regulations. Insurers will not be able to charge you extra, either, under any waiver. People with preexisting conditions, then, would have a triple safety net even in a state that took maximum use of the waivers: Tax credits, regulatory protection contingent on continuous coverage, and high-risk pools would all benefit them. 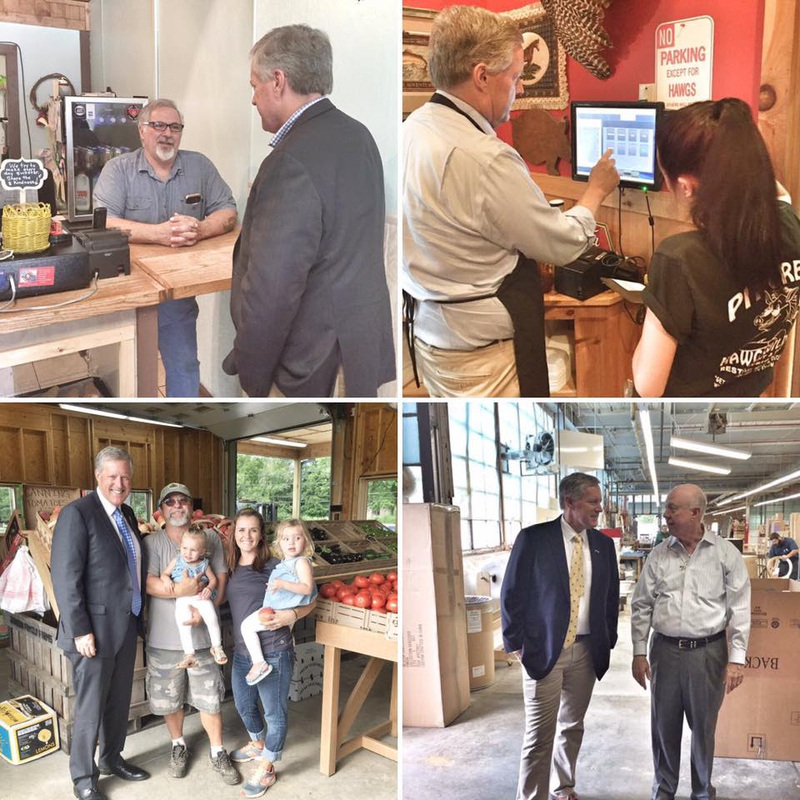 This week Congress observed Small Business Week, and let me tell you, there is no better small business community anywhere than right at home in Western North Carolina. When I think about the highlights of coming home, without a doubt, the visits to my friends and neighbors at local businesses in the area are at the top of the list every time. There are too many memories and pictures to count, but I thought you might enjoy some of the highlights here. These are the people that truly make our economy go. 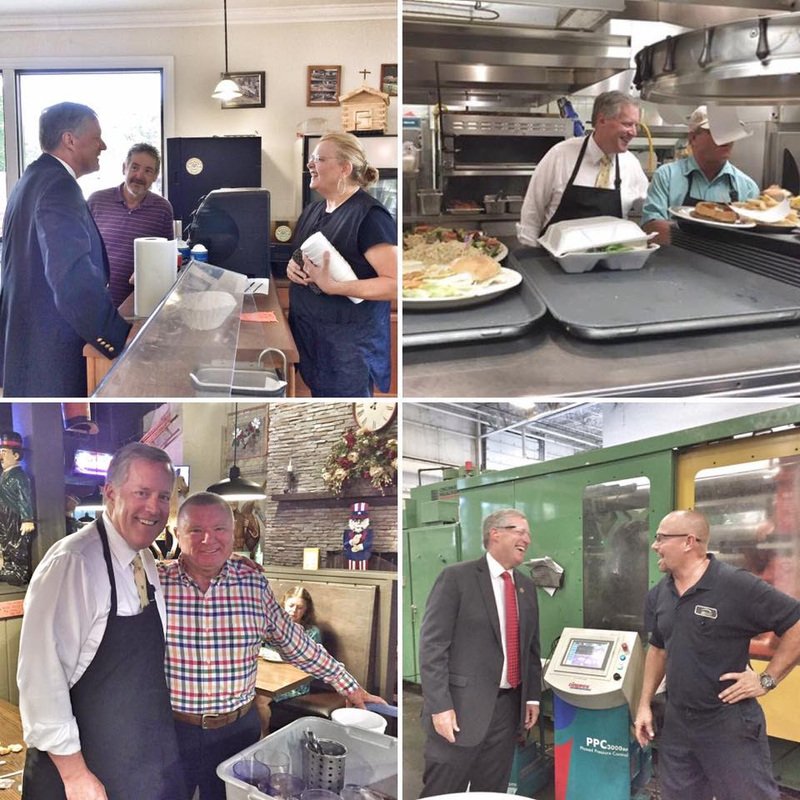 Thank you to the small businesses owners in WNC and around the country for all you and your hardworking employees do! President Donald Trump continues to unlock our job creators by rolling back excessive and burdensome Obama-era regulations. You may remember earlier this year when my office put out a recommendation list of rules and regulations for President Trump to roll back through Executive Order. Many of those regulations on the list have already been cut or significantly tailored. Last week, another set of those were added to the list as the President ordered steps to reduce the costly and ineffective Obama school lunch regulations. Every day we continue to make significant progress in reigning in the out of control bureaucracy in Washington. Let’s keep pushing forward! To read more, click here. We received great news from Friday’s Jobs Report! Our economy added over 211,000 new jobs, and the jobless rate is at its lowest point in the last 10 years. We have a long road ahead, but we’re off to a great start in getting needless bureaucracy out of the way of everyday Americans on Main Street. Click here to read more. It had been hard enough sending my two older children off to Georgetown and New York University. John’s enlisting was unexpected, so deeply unsettling. I did not relish the prospect of answering thequestion, “So where is John going to college?” from the parents who were itching to tell me all about how their son or daughter was going to Harvard. At the private high school John attended, no other students were going into the military. Have we wealthy and educated Americans all become pacifists? Is the world a safe place? Or have we just gotten used to having somebody else defend us? What is the future of our democracy when the sons and daughters of the janitors at our elite universities are far more likely to be put in harm’s way than are any of the students whose dorms their parents clean? Oh, how I wish so many of our younger generations could read this article. It makes me so sad to hear the way they talk with no respect for what their fathers, grandfathers and great grandfathers experienced so they can live in freedom. Please pass it on…. Hat tip to the person who emailed me this – you know who you are. You just have to admire Brant Clifton and his website The Daily Haymaker. I recommend signing up for his email updates. Click below to read one of his recent articles, where once again he hits the nail right on the head. 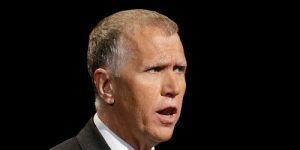 And lawmakers in other states have sought to advance legislative equivalents to HB2. It was just a matter of who lawmakers took their cues from. The passage of House Bill 142 did not appease the Human Rights Campaign or Equality NC, the two most vocal LGBT advocacy groups that caterwauled for a repeal of HB2. 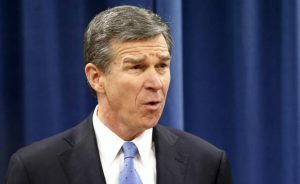 They have continued their campaign against the state because they say the replacement law still does not provide protections for self-proclaimed transgenders and “gender fluids” to use any restroom that matches their “identities.” Some businesses, groups, and public officials have said they will continue their boycotts of North Carolina in support of HRC and Equality NC.